In spite of a large number of theoretical, numerical and experimental studies in bypass transition to turbulence of fully developped channel flows, little attention has been paid to the channel entrance flow. For uniform inlet flow conditions and at high enough Reynolds numbers, the transition to turbulence can take place inside the boundary layers (Asai & Floryan POF 2003), well before the fully developed Poiseuille flow, in a region where the local velocity profiles remain stable. In comparison to the Blasius boundary layer, the presence of the upper wall induces a favorable pressure gradient that is known to have a stabilizing effect (Corbett & Bottaro POF 2000). Another aspect of the entrance flows that differs from the Blasius case is linked to the fact that two boundary layers are actually co-existing in the velocity profiles. This raises the question of their mutual interaction in the transition scenario of the flow. The confinement effect on the primary instability has been exhibited (Buffat etal EFMC10 2014) at a moderate Reynolds number (here Reh=2500 based on bulk velocity and channel half-height). 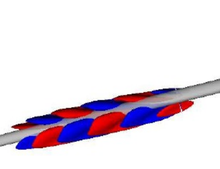 2D linear stability analysis has been performed on local profiles of the streaky flow (Buffat etal EFMC10 2014) and it has been shown that sinuous and varicous secondary instabilities co-exist but it does not fully explain the transition scenarii observed in DNS. For small amplitudes of the primary perturbation, transition is subsequent to sinuous instabilities whereas for larger amplitudes it is triggered by aricous ones and even when sinuous instabilities may develop upstream. To explore these scenarii and get rid of the locality asumption, a global linear stability analysis is performed in this study. Our method consists in solving the linearized equations during the DNS by implementing in-situ stability analysis (Buffat etal IJHPCA 2015). In a local framework, the important role of a short-term inviscid mechanism in bypassing secondary exponential instabilities of the streaks has been enlightened for both the laminar and turbulent regime (Hoepffner etal JFM 2005). The role of the latter mechanism and also the convective phenomenon in the space-time dynamics of the wavepacket propagating downstream will be analyzed using a global stability ramework and nonlinear simulations.